Keeping the current season and the popular North Indian winter specials in mind, the team at Sakinaka's Delhi Highway have curated a menu which will take you back either to Punjab or Rajasthan or both. Winter is a favourite season for many in India, especially in the north, for many of us love to relish the special delicious food which is curated every year, at homes across the northern cities. For generations, the protocol has been the same this season where one binge eats the delicacies (with packed nutrients) made by the moms and grannies. Mumbai’s Delhi Highway strives to do the same with an aim to bring some of these dishes to a restaurant menu by serving the best for your palate. The dishes curated from the northern flavours in the form of a ‘Thali’ will ensure that your taste buds are treated in a special way for the season. The team of chefs at Delhi highway has taken it up to themselves to present the desi flavors from the up north to the plate right here in the city, this way to help you indulge in delicious food and virtually let you wander in the very popular Punjab ke khet. The curated thali is packed with dishes like famous items inspired by the Pinds of Punjab. First thing first, I must admit that the thali was very tasty and satisfying. For the ones who love the nutrition-rich desi food, this winter special is a must-try. Sarson Ka Saag - the curry made out of leafy greens has a lot of Punjab-iyat packed in it. The flavours are cooked in mustard oil with along with a good amount of garlic (which is obviously food for the winter). Served along with it are two hot Makki Di Roti, soft and loaded with white butter. Accompanying the main two dishes are items like lehsun ka achaar, salad, desi makhan, kullad ki chaas, and gud (Jaggery) making this meal special and nostalgic in many ways. But, if the Punjabi cuisine is not on your favorite list, worry not. The team has a Rajasthani-alternative, where you are served the 'Maharaja' way The thali served is a lavish meal comprising of many courses, starting with the welcome drink - Orange Julius, which is both interesting by taste and quite refreshing. But soon after the drink, begins a list of food items, starting with the chaat, where you are presented with Dahi Bhalla, Mutter Kulche, and Gol Gappa shots. The three items served here are a true reflection to Delhi and the street food served there. The taste is authentic and you would want more of it, but hold on, the starters straight from the tandoor are next on the table. Six variants - Pesto Paneer tikka, Tandoori Mushrooms, Veg Seekh Kebab, Naram Dil Kebab, Hara Bhara Kebab, and Makai Kebab - are served hot along with chutneys and dips. My personal favourite here was the Naram Dil Kebab- it is crispy from the outside and moist and delicate from the inside, making it unique. But all these variants have distinguished flavours and marinations, which you palate would enjoy. 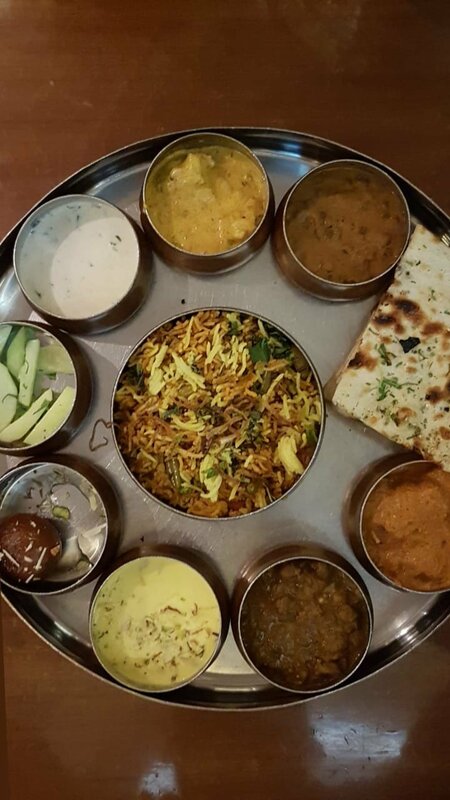 By now, you are almost full, but to the amusement, the main course of the Maharaja thali arrives with two sabzi, one variant of dal, one variant of kadi, Biryani, Delhi special lassi, and assorted Indian breads. Well, the thali is fulfilling with the number of dishes and the flavours make the soul happy. This vegetarian feast is rich and packed with taste - served the way it is for the Royals, straight from the kitchen of a palace. Bringing this experience to a worthy end is the dessert, which includes Gulab Jamun and Keshri Kheer. All I would suggest you do is not miss out on the specials before the season changes, as the team will definitely plan something new to meet you again. But for now, believe me, treating your soul with such meals is pure bliss.